Pure perfection! Stunning end-unit boasting soaring ceilings, a bright and open floor plan, an array of windows and MORE! Inviting entry with gleaming hardwood flooring. The two-story, vaulted living room is open to the dining area and features a cozy fireplace. With updated cabinetry, the chef's kitchen also features solid surface counters, stainless steel appliances, a custom backsplash and an eating area. Main level master suite offers you a walk-in closet and a private bath with double bowl vanity, soaking tub and separate shower. An additional bedroom with generous closet space, a full bathroom and a laundry room complete the main level. The second level features a loft that could double as a third bedroom with generous closet space and a full bathroom. Enjoy the outdoors on the private patio overlooking the manicured yard. Attached two-car garage. 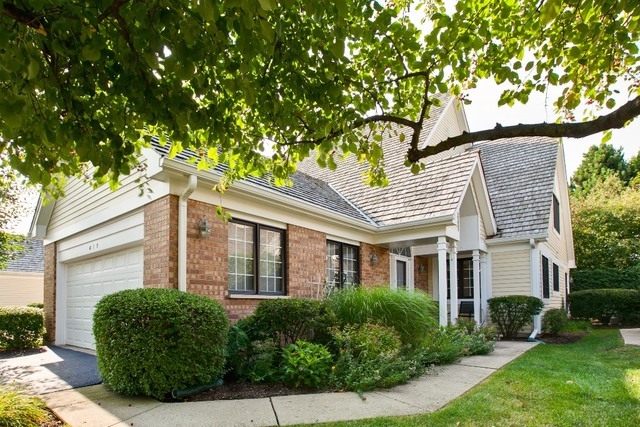 Minutes to downtown Libertyville, METRA and MORE! NEW windows in living and dining room (2017). A MUST SEE!